Can our public buildings be secure? Just as construction was about to begin on the Freedom Tower at the World Trade Center site, Gov. George Pataki announced that the 1,776-foot skyscraper will be redesigned. Apparently, new “security concerns” expressed by the NYPD require the relocation of the building farther away from the street to reduce the danger of truck bombs and the reconfiguration of the tower’s base to make it more blast-resistant. The designers have gone back to the drawing boards. A building that is designed to withstand an explosion at street level would probably appear somewhat heavier, yet there is no intrinsic reason that a massive building could not also be beautiful. The Federal Reserve Bank of New York on Liberty Street, for example, not far from the World Trade Center site, is an imposing and apparently impregnable pile of rusticated masonry that was modeled on a fortified Florentine palace. 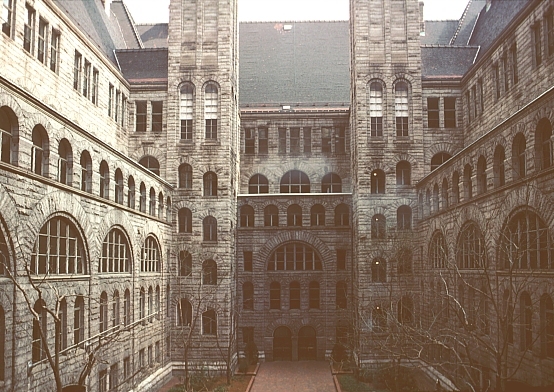 One thinks also of H. H. Richardson’s wonderfully ponderous masterpieces, such as the Allegheny County Buildings in Pittsburgh, or the late, lamented Marshall Field store in Chicago. My favorite New York skyscraper, Raymond Hood’s RCA Building, is hardly Richardsonian, but it is on the hefty side. And while modern high-rises have become so transparent and light that they are almost dainty, a muscular behemoth such as the John Hancock Building in Chicago illustrates an alternative approach. But surely a heavy-looking Freedom Tower would be a barefaced capitulation to terrorism. We can’t change the way we live—that would mean we’ve capitulated to the terrorists, right? But there’s been a lot of capitulation already. Most public buildings are ringed by Jersey barriers and heavy concrete planters, and many streets remain closed to vehicular traffic. Pennsylvania Avenue in front of the White House has been turned into a permanent pedestrian mall. Bollards sprout like steel crabgrass. It is unclear how much of this is real protection and how much is merely the appearance of security: At least we’re doing something. While it would be irresponsible not to take what measures we can against the threat of terror, there is something slightly hopeless about installing security devices aimed at foiling a terrorist plot whose precise shape remains unknown. That is the quandary of fighting terror. Doing nothing risks a repeat performance; doing something merely requires terrorists to come up with different tactics. Innumerable plane hijackings in the 1970s caused airlines to progressively beef up security. When they matched bags to passengers, terrorists hid explosives in the luggage of unaware travelers. The bomb that downed Pan Am Flight 103 was camouflaged by being hidden in a radio; the 9/11 suicide terrorists didn’t use explosives at all. If there is one thing that events in Belfast, Beirut, and Baghdad have demonstrated, it is that while it’s possible to protect some places some of the time, it’s impossible to protect all places all of the time. If we fortify public buildings, terrorism moves to cafes; if we toughen up downtown, it emerges in neighborhoods; if we harden neighborhoods, it will find another, softer target. Given the slippery nature of the threat, the security debate at the Freedom Tower should move beyond architectural design. In the long run, better intelligence, better coordination between security agencies, and better communication equipment for the police and fire departments will make a bigger difference than how many inches of concrete there are around the structural columns or exactly how many feet from the building to the street curb.